1. Heat oil in a pan and then put Whisker Sheat fish to a pan and Fry it until it change to golden. Serve to a dish. 2. Make a chili sauce by heat a pan and then put garlic, chili, tamarind, sugar and fish sauce. Stir it until it sticky. 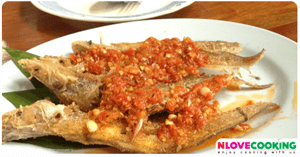 Put chili sauce to a fried fish dish. 3. Serve Fried Whisker sheat fish with chili sauce and put coriander on top. Eat with jasmin rice.